No more stumbling around in the dark or straining your eyes! No more uncomfortable head straps! Most importantly, no more worrying about messing up your plants' photoperiod! Horticulture Green LED Headlight will keep you and your plants under good eyes and out of the dark! Green light doesn't affect your plants like light in other spectrums does, so you can enjoy nice bright light without a worry. Item size: 3" x 2" x 2"
Convenience at Night: Grow room headlight allows you to enter grow rooms during the night cycle and check up your plants. 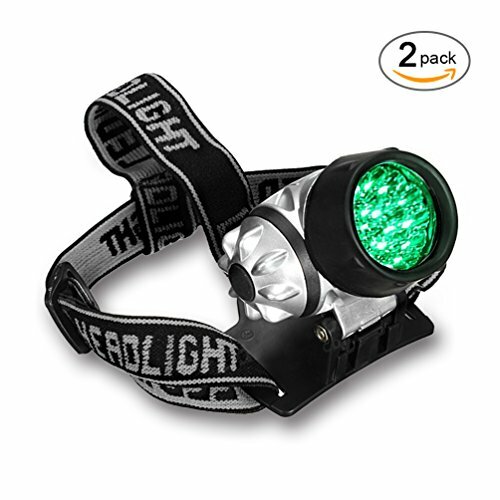 No Harmful Effects: A bright green light beam that doesn't disturb photo-period sensitive plants or affect your eyes. Amazing Visibility and Strength: 19 High Intensity and powerful green LED bulbs, bright enough to safely make equipment adjustments in a pitch-black room. Lighting range 200-350m. Brightness Adjustability: High-intensity LED light, adjustable between 3 levels of brightness. 4-mode Operation: 1st click - 1 x LED On, 2nd click - 7 x LEDs On, 3rd click - 19x LEDs On, 4th click - Strobe.